In about Dec 1977 my husband and I went to visit his family for a family reunion. I had just graduated from college the year before, so was 23 years old, and my husband was about 27. I was an office worker at the state capitol and he was a certified auto mechanic. We drove from Tampa FL to Houston TX, taking the interstates, driving west passing thru New Orleans. As we were passing thru New Orleans I woke up and a few minutes later saw very bright light approaching in the Western sky. Husband was driving and saw it too. We speculated about what it could be, even laughing about a UFO. We at first thought maybe there was an airport nearby. At this point we were still on the outskirts of the city and I believe there was a little air traffic, but nothing else in the sky nearly as bright as this light. As we continued to drive west we eventually left behind any town area and continued over bayou/swamp on elevated divided hwy/bridge road. We continued to watch the bright light, as it was interesting and the drive was a long one. 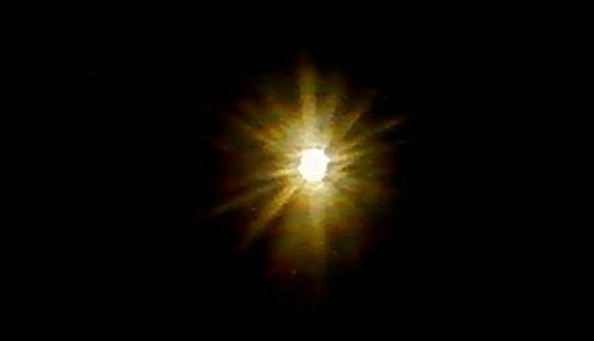 Although initially we were tracking it toward our right front of our car heading west and it appeared far away as just a very bright light, as we watched it seemed to travel thru sky toward the left side of our vision, so when we finally passed it, it was on the far left (drivers side of car). (Sort of like a lazy s curve.) We saw that the light we had been watching appear to stall over a cypress swamp. No civilization/man-made structures/towns were nearby, nothing but swamp and water and bridge/road. The object appeared to stall or hover over the swamp above a stand of very high cypress trees. There were no power poles or other structures anywhere nearby that would confuse where it was or could be attached to. It appeared to be just floating silently, alone. We had watched the light for at least 20-30 minutes by this time, and now were considerably closer. It was a good way above the trees, probably at least 50 ft. From the roadway the UFO was perhaps 500 ft to our left, and 150 ft up. It was massive. We were struck by how large it appeared to be, like the size of a football field or 10 large houses stuck together. Altho this was at night time around 2 am, the stars were very bright. The UFO appeared to be shaped like a capital H and had appendages like antennae and/or machines all over its surface, not smooth at all. We could determine its shape through the stars, as it was a very clear, still, cold, starry night with enough light to make out the shape easily. It didnt move and we drove slower and slower, finally passing it altogether. As we were now driving on an elevated roadway bridge over a swamp, there was no place to stop or pull over or even call for help. During this entire time we passed only a couple other cars heading east into New Orleans but I could not tell if they saw the UFO or not. This might sound stupid, but as it wasnt moving, nor making noise or doing anything at all but hovering, we just kept driving west, not quite knowing what else to do. It didnt seem like a good idea to just stop and get out. We were driving over the bayou, in the dark. Plus, we were still on a divided road with the object hovering on the farthest side of the separate eastbound bridge to our left. We just kept asking each other, what IS it? Eventually we reached the end of the swamp area and pulled over, the UFO miles behind us. My husband and I decided to sketch independently of each other what we each thought we saw. We both drew an H shape. When we got to Houston we spent time with family and went to see the new movie, Close Encounters of the Third Kind. I recall being a little freaked when we saw something in the film that was close in shape to what we saw that night. NOTE: The above image is a rendering. Thanks to MUFON case file system. 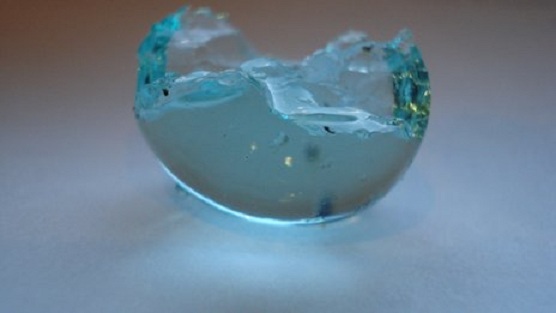 A man in Dorset has been left mystified after tiny blue spheres fell from the sky into his garden. Steve Hornsby from Bournemouth said the 3cm diameter balls came raining down late on Thursday afternoon during a hail storm. He found about a dozen of the balls in his garden. He said: “[They’re] difficult to pick up, I had to get a spoon and flick them into a jam jar.” The Met Office said the jelly-like substance was “not meteorological”. Mr Hornsby, a former aircraft engineer, said: “The sky went a really dark yellow colour. ” As I walked outside to go to the garage there was an instant hail storm for a few seconds and I thought, ‘what’s that in the grass’?” Mr Hornsby said he was keeping the balls in his fridge while he tried to find out what they were. They have no smell. Walking around his garden he found many more blue spheres were scattered across the grass. He said: “The have an exterior shell with a softer inner but have no smell, aren’t sticky and do not melt.” Mr Hornsby said he was keeping the balls in his fridge while he tried to find out what they were. Josie Pegg, an applied science research assistant at Bournemouth University, speculated that the apparently strange phenomena might be “marine invertebrate eggs”. “These have been implicated in previous ‘strange goo’ incidents,” she said. “I’d have thought it’s a little early for spawning but I suppose we’ve had a very mild winter. “The transmission of eggs on birds’ feet is well documented and I guess if a bird was caught out in a storm this could be the cause.” KENS NOTE: This explanation is the lamest thing I have ever heard. Eggs on birds feet. Now I have heard it all. On the night of April 24th(that was a Friday) 2009, My friend contacted me at my house to tell me to come over and hang out at his place, ALSO mentioning that he had saw strange lights headed west on LA HWY 8 earlier in the evening, just after sunset. I live in Evans, a community in West central Louisiana, and he lives 8 miles away in South East Texas, in a town called Burkeville. I left my house, on what was probably the most starry night I had ever seen in my life. I began driving North on LA HWY 111. Approaching another small community called Burr Ferry, the aforementioned lights in the North-East sky caught my attention, I initially thought them to be Baseball field lights on a field just near my location. However, the lights in that field are white, these lights were Orange and were orb like and sat side by side. I immediately thought of the lights my friend saw earlier in the evening so I pulled over and watched the lights for a minute or two. They weren’t moving, so I jumped back into the car, and sped to where they appeared to be, which was I thought, above the baseball field. Upon arrival I realized the lights were much further away. I turned around, and continued quickly to my friends house. I pulled up in his driveway honking the horn, and when he came out of his house I told him to grab a camera and jump in to the truck, that the UFO was in Burr Ferry! He done so, and we took off. As we approached the state line, we came to an opening which was on our left. This was the only time in which we saw the structure of the “craft”. It had one yellow light on the SIDE, which I assumed was what we were looking at, unlike what I had seen just minutes earlier. As soon as we came to a stop on the side of the road, the “craft” disappeared. What made it so strange was that the WHOLE THING disappeared, not just the light. And it was as if nothing was ever there. We started driving again. About 5 or 6 miles down the road, now in LA travelling east on HWY 8, the “craft” reappeared. However, this time we saw the two orange orb lights. We immediately pulled over. We captured video of the craft for approx. 3 minutes, when suddenly the left orb slowly disappeared, the right orb followed in suit. Again, no structure could be seen, it was as if nothing had been there. We travelled another 5 miles down HWY 8. Exactly 6 minutes later, the lights reappeared. This time we were much closer to them. I would estimate 200 yards from the “craft” we stood recording them, slightly pulsating, still side by side, and making no noise at all. The lights, again were visible for 6 minutes, when the left orb shrunk and disappeared, and the right done the same. Again, there was NO structure visible on this clearest of clear nights, the lights were gone and again, it was as if they were never there. I haven’t seen them since. I have included a picture of what we saw. The quality isn’t that great, because we were recording on a sony digital camera not a mini dv. Even the pictures we took weren’t that great. I have the videos still. If you would like to see them please let me know. This sighting was reported to World Ufo Photos. Special thanks to the witness, William Stanley of Newton Texas. 7 of us witnessed a UFO do the most amazing unbelievable things! About 8pm, just getting dusk, as we were all standing outside on the patio, we watched a UFO event which was reported to the Sheriff, (who ridiculed her, gave her number for National Ufo center and once again she called and was ridiculed ). 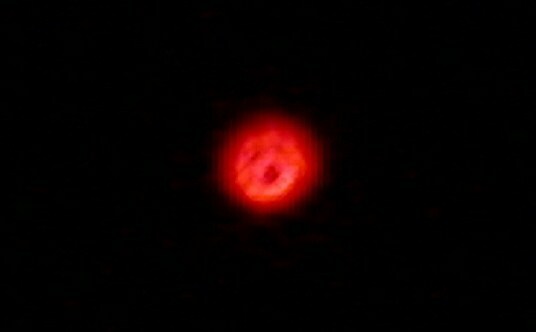 First we spotted an huge orange/yellow burning ball, looked exactly like picture we see of our burning sun, this UFO was stationary and hung in the dark sky over a ravine when we first saw it. 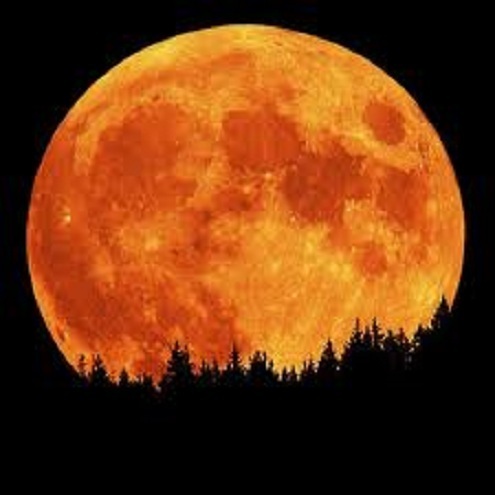 Next it changed slowly become a dark red glowing ember colored orb with dark lines, then it began to close up on its self and went from a burning sun/orb to a small bright bright luminescent light which zipped all over the night sky, instantly changing from a bright bright light to burning sun/orb then back to bright white light. This went on for a couple of hours, we were so fascinated we didn’t notice the time. Then it landed on the hill side across the ravine from our position in Fricot City (which lays on a hill top). We were so excited we watched for hours. After the UFO landed across the way from us, it continued to change from Orange/Yellow burning sun to bright bright light and we started to worry it would start a fire in the dry grass it had landed on, although each time it became a bright light or orange sun you could see the outline or shadows of the Oak trees that were in between us and of the UFO. We continued to watch the UFO until about 11pm then I became very very sleepy, then my brother turns to me and tells me he can hardly keep his eyes open either so we went to bed…awaken at day break to the sound of jet engines to find the Air Force and Army Choppers, there were military jeeps and men and others in same place we watched the UFO land the night before. I couldn’t seem to care or get excited about all the actions caused by the UFO landing Quite the opposite of who I really am!! Completely unnatural reaction for me! NOTE: The above image is a rendering. It was May of our last year of High School and four of us decided to camp out for the weekend at Kananaskis Lakes, west of Calgary Alberta – an area familiar to me. At that time, conditions were happily primitive. My friend and I arrived in the early afternoon, two of our party had already set up their tent on the exposed beach next to the lower lake. We camped above them, nearer to the upper lake and next to the connecting sluiceway, about 50 feet east of the upper dam and somewhat lower than the dam in altitude, a position that would give us early-morning warming sun coming in over the lower lake. As we set up our tent that afternoon and also later as we hiked the north shore of the upper lake, we noticed a forestry helicopter flying up and down the Kananaskis Valley, passing within two miles of us, the sound of its motor and rotors echoing off of the surrounding mountains. Around 6 to 7 oclock we lit a fire, cooked an evening meal and, following that, got out our guitars to play and sing for a while. The scene, at this point, is vivid in my memory: I am sitting on a stump, looking beyond Roger at an exquisitely picturesque mountain valley, the lower elevations of which are in shade, as am I. The other two members of my group are, like us, sitting beside their fire, 150 yards away from us, next to the absolutely still Lower Kananaskis lake. The West side of the valley, still in brilliant sunshine, is reflected perfectly in the lakewater. The silence is so profound that it seems almost wrong to mar it with our music but we do so anyway. My friend has a guitar that is much more expensive that mine, so it shocks me when he drops it. It bounces off of something, probably his feet, and into the fire. I grab it quickly before it begins to burn, then look at him for an explanation. I see terror on his face,looking over my shoulder at something behind me. I step towards him, across the fire and turn, a guitar dangling from each hand (held by the neck), expecting to see a bear. I see nothing. I ask him “What did you see?” and “Where is it?” but get no answer. To my left, I see him going into the tent. Im not frightened but I still dont see anything, so I stand still and look carefully into the shadows of the trees nearest us in the direction that my campanion had been looking, which is to the west, uphill, in the direction of the North shore of the Upper Kananaskis Lake (which is over the dam and out of sight). Movement is what Im looking for and that is exactly what gets my attention, but it isnt in the shadows, it is above the trees and visible against the clear sky, on the other side of the tree-tops. Coming towards me but coming slowly. At this point, Im beginning to comprehend that something is wrong but I cant get my mind to formulate a thought. My senses are acute and record details but my thought processes are very slow. It is as if there are two of me: one observing and another thinking. The me that is observing sees a silver-grey shape approaching and descending from beyond the trees at a speed that, in retrospect, appeared to be 15 to 20 miles/hour. It just clears the nearest tree-tops, which would put it at well under 50 vertical feet above the ground at that point but still 80 or more feet above me and 200 yards away (the trees are upslope from me). It continues to descent as it approaches me, but not at the same rate as the slope of the ground, so the object is 50 feet or so above me as it passes over me – not directly over me, but about 20 degrees or so off the vertical, so Im viewing this object from below, at about a 70 degree angle and at a distance of from 50 to 60 feet (20 yards). It is still moving slowly. There are what appears to be windows around the circumference of the object both on the main body and on the upper turret. There are also colored lights pulsing around the perimeter of the main body. Movement is steady, silent and has a quality of lightness or fragility. The object continues on its path, passing over my companions on the beach and coming to rest less than 6 feet above the surface of the lake where it remains for 5 to 10 seconds in full view of at least one of them but neither of them seems aware of it. Under the object, the glassy surface of the water is undisturbed. Simultaneously, two things happen: my thoughts return to normal with: “Its a UFO!” and the object shoots off at roughly a 45 degree angle into the clear blue sky and DISAPPEARS INTO THE DISTANCE in roughly one second, with NO APPARENT ACCELERATION. While all of that was going on, the other me (remember? )was struggling to think with a mind that was functioning like a swimmer in molasses: “Trying to identify this thing. Helicopter? Somethings wrong. Wheres the noise? Is it landing? Whats wrong with it? Not a helicopter? Why dont the guys look up at it? Whats wrong with them? Whats wrong with the water? …………ITS A UFO!” Only the last three words were word-thoughts. All the rest were conceptual, non-verbal thoughts which Ive put into words after the event. There was no emotion felt during the experience and no confusion, just what can best be described as a temporal duality: my thoughts and my physical experience just didnt match up. I remembering staring at the point of blue sky into which the UFO had disappeared and calling to my friend in the tent who left me with his guitar. When he didnt answer, I went into the tent feeling excited and wanting to talk about what had just happened. He was in his sleeping bag in mild shock and refused to talk. He just wanted to go home, which we did next morning, still without any discussion. I dropped him off at his home, and we haven’t seen each other since that time. The other two guys down on the beach neither saw nor heard the UFO though it passed only about 30 feet above them. Their dog kept them up all night growling at something though. NOTE: The above image is a rendering. The most profound question asked by mankind is: are we alone? So the second most profound question must be: where should we look if we’re not alone? Now, two prominent scientists have published a paper suggesting that although we have an entire universe to seek out the proverbial alien needle in a haystack, perhaps looking in our own backyard would be a good place to start. Paul Davies and Robert Wagner of Arizona State University have suggested a crowd-sourcing effort to find artificial structures on the moon. After all, lunar missions like NASA’s Lunar Reconnaissance Orbiter are returning some dazzling, high-resolution imagery of the moon’s surface. If aliens have been there, perhaps we could spot evidence of their presence. “Although there is only a tiny probability that alien technology would have left traces on the moon in the form of an artifact or surface modification of lunar features, this location has the virtue of being close, and of preserving traces for an immense duration,” Davies and Wagner say in their paper published in the journal Acta Astronautica (doi:10.1016/j.actaastro.2011.10.022). Indeed, due to the moon’s pristine environment, any modification of lunar surface features will remain preserved for eons — the lack of an atmosphere means features are not eroded away. Unless intelligent aliens came, saw and then covered their tracks, perhaps they left something as basic as a footprint for us to find. If these hypothetical aliens are advanced enough to traverse the vast distances between the stars, and if they decided to pay the Earth-moon system a visit over the past few million years, they may have used the lunar surface as an ideal observation post. Logical, right?. The idea that some kind of alien artifact may have been left behind then makes sense. This “artifact” could be a footprint, spacecraft or structure — the LRO can spot the Apollo landers and astronauts’ preserved footprints from orbit (pictured top), so it stands to reason that we have the technology to carry out this proposed lunar hunt. “Systematic scrutiny of the LRO photographic images is being routinely conducted anyway for planetary science purposes, and this program could readily be expanded and outsourced at little extra cost to accommodate SETI goals, after the fashion of the SETI@home and Galaxy Zoo projects,” Davies and Wagner point out. Although the probability for success is low, building a crowd-sourcing effort like the hugely popular SETI@home and Galaxy Zoo projects could be a very efficient and low-cost means to analyze the lunar surface. Simply distribute images being beamed back from lunar satellites to participating members of the public — using PC idle time (like SETI@Home) or asking for voluntary participation (like Galaxy Zoo) — and see if any strange shapes in the lunar regolith need some follow-up investigation. Clifford Clift, International Director of the Mutual UFO Network (MUFON), has announced he will be stepping down as International Director, effective January 31, 2012. David MacDonald, member of MUFON’s board of Directors and State Director for Kentucky will replace Clift as International Director (ID) February 1, 2012. Clift is stepping down as ID due to personal commitments and family health issues, which will require his full attention. Clift also said, “I know my limitations and the requirements of time MUFON needs to be successful. I can’t be successful with both.” Clift would like to express his deep gratitude to MUFON subscribers/members for their commitment in seeing that MUFON achieves the fulfillment of its goals and thanks everyone for their continued support over the past two years. David MacDonald is no stranger to MUFON and the organization’s mission. David is currently on MUFON’s Board of Directors, Assistant Director of Investigations, MUFON’s Star Team Administrator, the conductor of testing for new Field Investigators and much more. As a business man, over the years David has had numerous successful businesses. Currently, he runs a school for Pilots and Aircraft Dispatchers. Additionally, he owns and runs Flamingo Air, a Charter Airline. 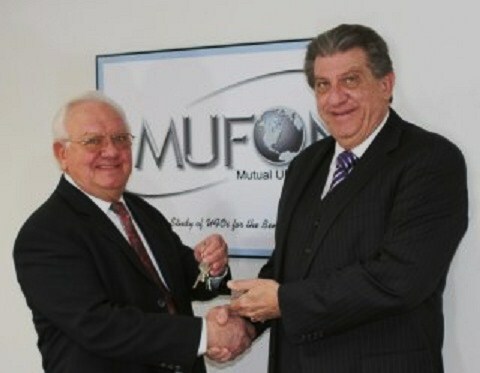 David will move MUFON International Headquarters to Cincinnati, Ohio, where he operates Global Airline Education Center and Campus. Being centrally located, the International Headquarters will be easily accessible to many more members. Cincinnati is within a 6 hour drive for 60% of the population of the United States. The location will have high visibility to pilots and many perspective new MUFON members in the aviation industry as well as increased exposure to the general public which will be a real benefit. MUFON will have room for office space, storage on site, and a walk-in merchandise store. We ask everyone to have patience during this transition period. Keep your eyes on the sky and let’s all welcome Mr. David MacDonald as MUFON’s new International Director! KEN’S NOTE: I have been in contact with Cliff for the last year and I hope him all the best. He will be missed by all. While traveling South in the slow lane, on Interstate 91, at 4:50 am, I looked in my drivers side mirror and noticed a Black Triangular object with large yellow lights approximately 50ft. above and directly over the roof of a car, in the fast lane. After about 5 seconds I refocused my driving to the road in front of me as I was headed towards the breakdown lane. I maneuvered my vehicle back into the slow lane and once again looked into the drivers side mirror and the object was gone. The vehicle behind me in the fast lane was still proceeding south behind me. The entire event lasted about 10 seconds. As I proceeded South, still looking through my drivers side window and passenger side window into the sky looking for the object, it didnt reappear! After I proceeded approximately a mile South on the interstate I saw what looked like a red shooting star with a streak in the sky directly in front of me lasting about 2 seconds. NOTE: The above image is a rendering. My friend Jason was the first to notice the lights and point them out. 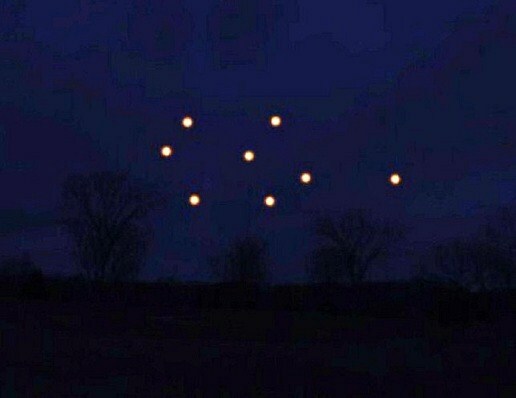 We looked NE across the park to see 8 orange glowing UFOs paired off in a staggered formation about 30-40 degrees above the horizon. As we looked across the highway at the Gerald Ford International Airport we saw searchlights moving across the sky over the airport. My first impression based on the pulsating glow of the objects was that of aerial flares. However the night was breezy and if the objects had indeed been flares they would have been drifting in the wind. 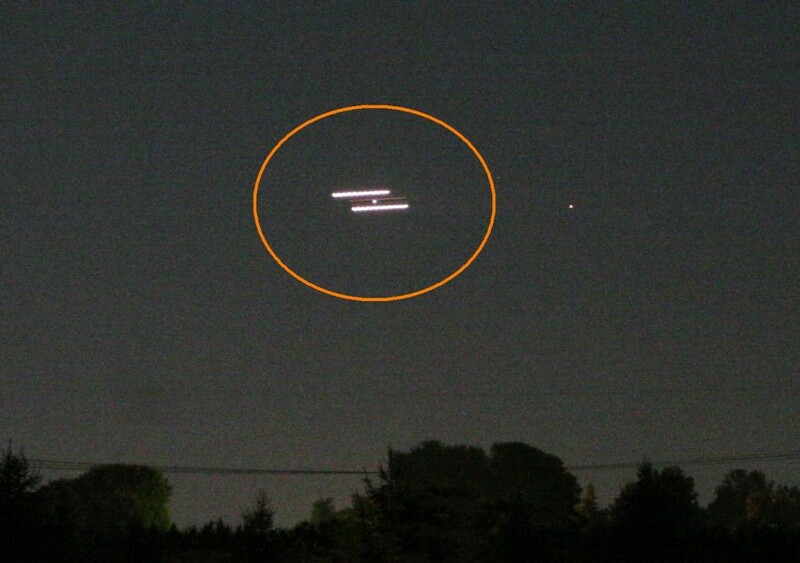 The 8 objects remained stationary, paired off at equal distance from each other in their staggered formation. No downward fall or drift with the wind currents. The objects were completely silent. (I don’t know who else in the park that night may have noticed the phenomenon although it was clearly visible for at least 5 minutes.) I was the most excited, I kept asking everyone around me “Are you seeing this? 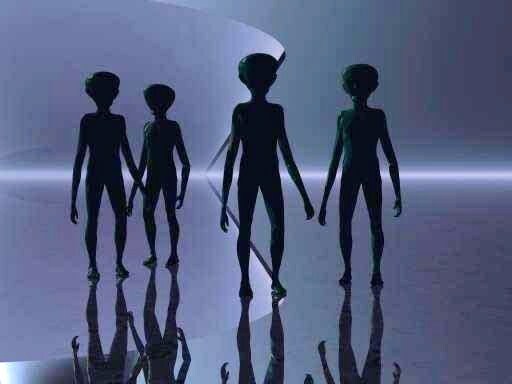 Tell me you’re seeing this.” the sighting was verified by the 5 other people that made up our small ‘squad’ which included several of my closest friends. I was frustrated because I had brought a camera to the event but had left it locked in my car for fear of it being lost or damaged during the course of the game. The objects disappeared one by one over the course of 45 seconds to a minute, I personally witnessed at least two of the objects disappear as we continued moving along the perimeter of the park. By the time we came to a halt, the objects had all vanished. NOTE: The above image is a rendering. I was the General Manager of a hotel in Niagara Falls. Our hotel sat at the end of a strip and overlooked the horseshoe Falls. It was a warm October night. The sky was clear and free from clouds. There was absolutely no traffic and it was very quiet. At approx. 10:30pm my security officer and I were standing out front of the hotel looking out over the Falls and the Niagara River. My security officer said to me, either someone went in the river or that looks like a UFO. It was not uncommon to see search and rescue helicopters out over the river. I looked up and saw a very bright white light shinning down on the water moving towards us. As it got closer the light changed from shinning down to pointing towards us. The closer it got the more it elevated higher. I said to my security officer that if it keeps on the same path it’s going to fly just to the left of of the hotel over a side road. My security officer was frozen at the front entrance and would not follow me to the side road. I stood right in the middle of the road and waited. Soon it was right over top of me. The first thing that struck me was it did not make a sound. The second was that it was very large. 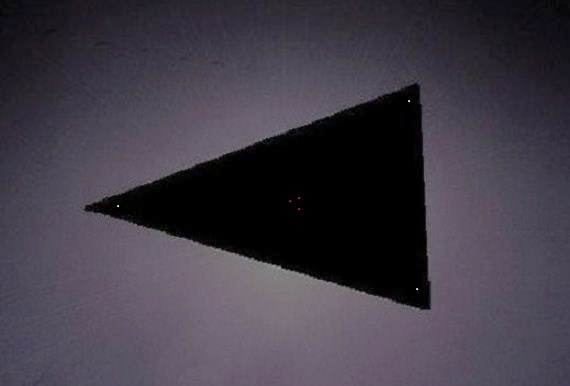 It was a black triangle with 4 lights underneath. 2 white lights on the back and another on the front tip. In the middle of craft was a red light that pulsed very slowly. The sighting seemed to last a long time as the craft moved so slow. I would say it was only a hundred feet above our 32 story hotel. It continued west until it was completely out of sight. About a week later it came back around 1:00am when I was outside in our parking lot. This time it was much higher and traveling West to East. It was also moving much faster. It continued over the river until it was out of sight. Some very strange things began to happen after my sighting as there is much more to the story. I would be more than happy to discuss these events if you wish to contact me. NOTE: The above image is a rendering. I was on my way home from work, around 8:10PM EST driving on RT 85 eastbound towards my home when I saw a 3 light tipped triangle cross the road over the tree tops. I was on the phone with my mother at the time, and stated that I saw some weird lights. It was enormous, easily larger than a commercial large passenger air craft if it was within 100 feet of the tree tops. 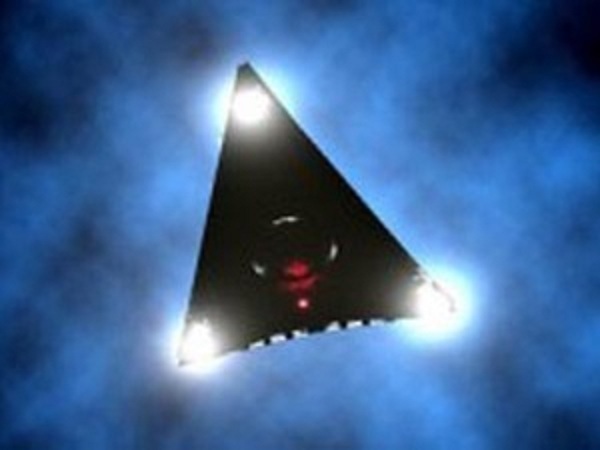 There were no visible lights other than the 3 bright white exterior lights on each of the 3 tips of the triangle. You could not see through the object, and the sky was clear. As soon as the first trangle was out of sight, not more than 2 seconds behind it, I saw a second identical triangle pass along the same path. If I was eastbound on 85 both passed me going left to right. At the time I saw the second light I was literally so blown away I was yelling into the phone. I got off the phone and by the time I got to my home, with wide open sky I could see nothing. As stated before, the triangles both were enourmous and identical, no blinking lights, no sound. As I saw the second triangle I rolled down my window. If it were commercial aircraft, it would have been so close and so low there would have to have been audible noise. It was completely silent outside save the noise of my vehicle on the road. NOTE: The above image is a rendering. My son and I were driving south on Keatonville road returning home from visiting my cousins. I pulled to the side of the road and stopped to light a cigarette. After doing so, I noticed some strange looking lights in the sky very near us. My son and I then observed two brightly colored orbs of light. One blue-one red. They seemed to be going into and out of a small cloud, visible one moment and obstructed the next. That’s when we saw it. We watched in shock and disbelief as the disc shaped craft emerged from the small cloud and silently and swiftly ascended to less than fifty yards from our car. It continued to slowly move to about thirty yards from us. They were close enough for me to see them looking at us through windows. They seemed to be somewhat small from that distance, then a sudden fear overcame me and I remember attempting to drive off as fast as I could. Then the next thing we remember is we are still in the car, the cigarette has burned up in the ashtray, the car is not running now,and we are sitting slumped over in the seats. I looked up and watched the craft leave the area. I started the car and we drove home as fast as we could. We both felt like we had been asleep or drugged or hypnotised. We checked in with my cousin upon returning home and he confirmed our hunch about the missing time at least thirty minutes, maybe forty five minutes were missing, not to mention the cigarette I didn’t get to smoke. Three days later I removed from my own finger a triangle shaped object that looked semi transparent, like silicone but it was harder than a rock. The object was a little smaller in size than a B B. The craft seemed to float unaffected by earths gravity. When it left, it moved off slowly at first then accelerated at so fast that it seemed to vanish. There were no clouds in the sky that night except for the one it came out of. Visibility was very good. We had a close encounter of the Third or possibly the Fourth kind. I went from skeptical to a absolute believer in the first five to ten seconds of the close up visual of the craft with the litte beings peering at us. We decided we didn’t talk about it outside of each other for fear people would not be able to believe the truth. I am getting older now and I think it’s time to tell the truth. GOD be with us-all. NOTE: The above image is a rendering. I was coming home at 9:45 pm, and parked my car on the street. 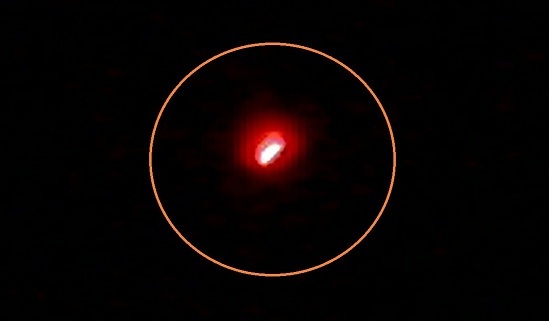 I realized that a bright red light was viewable from my front yard to the east of my house, and that it was similiar, or the same red light ufo that I viewed in the east in september in the same neighborhood. I immediately called a friend that lives a few blocks away, that viewed a red light ufo with me in september at his house. He in turn called his father, who lives up on the bench in Boise Idaho, around 4-5 miles from where we live, which is several hundred feet lower in elevation than his father lives, in a shallow river valley. His father confirmed that the UFO was fairly high in the sky. This gives me reason to think that the UFO was probably over 500 feet high in the sky, any lower, and my friends father would have only barely been able to see it, and it would probably have around the same height as the mountains behind Boise. After calling my friend, I ran inside after trying to catch a photo using my blackberry phone. taking a slightly different path. the entire movement period was no longer than a few minutes if that. It moved at an even pace, and I wondered how anything could move that fast in the sky. If it was a balloon or such being towed from the ground, a balloon/blimp with an engine would have to be moving pretty good to cover that distance once it was stationary again. I commenced taking more photos and I drained the battery, but was able to get around 9 photos that had little movement, and actually showed either artifacts of the light/camera, or actual structure of what I believe is plasma formations. Around the mid point of the event, a plane high in the sky flew above us, and could probably see the UFO as well. The entire viewing lasted around 35-40 minutes. It started pulsating faster, and then started strobing for the first time, it strobed completely on and off around 4-6 times at a relative even pace, and then quickly increased completely strobing on and off, and then just completely dissapeared. I have only seen a UFO twice before this, in september a few months before, and what we saw on dec 24 looked very similiar. I am convinced this is some sort of plasma formation. 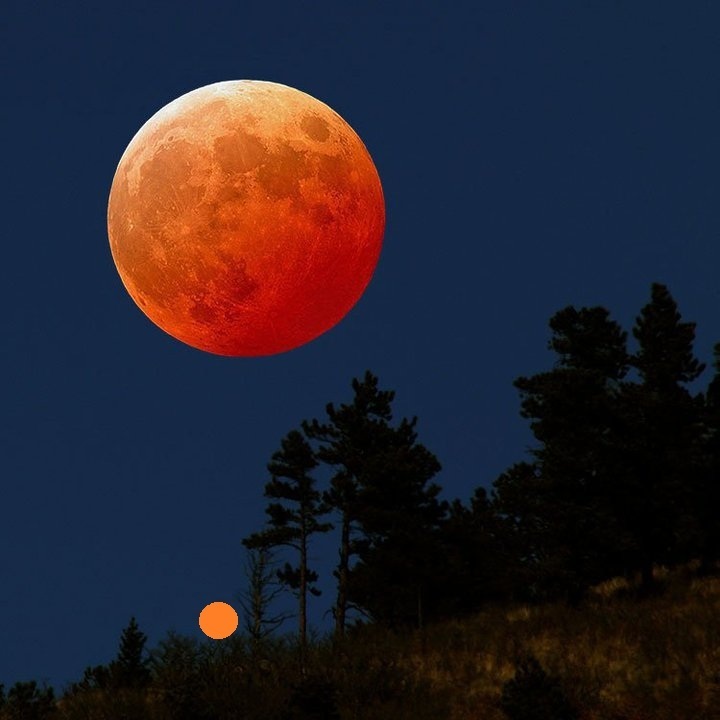 There were some similiar reports the next night in Boise Idaho, and I noticed also reports in Oregon, Washington, and California that sounded similiar. In one photo, the interior looks as if it has bilateral symmetry going on, much like what a walnut shell looks like some sources claim that hovering UFOs are in a low energy use period, and glow red, but as they speed up, they turn blue/white. That might fit somewhat with what I saw in McCall. 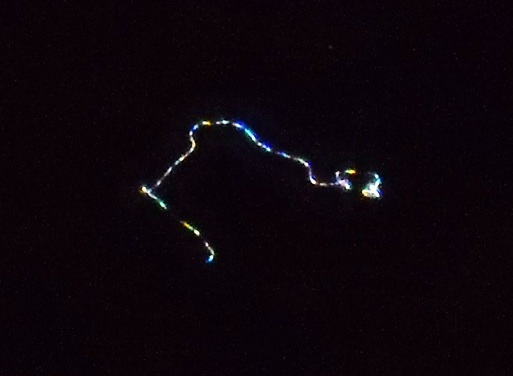 Absolutely one of the most exciting nights of my life, in that I was finally able to get photos of a UFO. Everything fell together, right place, right time, camera in the house, and a UFO that sticks around for long enough. At approximately 10:00pm EST, my teenage son was alarmed by the sight of a colorful, star-like object that was moving at incredible speeds. He had already observed it for about an hour before coming to me. When I first saw it, I was shocked because I had never seen anything like this in my lifetime. After only a couple minutes of looking at it, I immediately grabbed my digital camera and took 2 videos and then several pictures. I went inside and downloaded the images and I took some time to crop the photos and zoom in on them. My son and I were surprised that after all that time, the object was still out there so I took more pictures of it. After looking at the second set of pictures, the object was either gone or no longer visible. These pictures have been cropped – absolutley no editing other than that and I have all the originals. A friend suggested that I download the pics and video on this website. I was and still am astonished. So after that I made sure to look in the area, every night, to see if ‘it’ would come back and to my amazement, lastnight, it did which I will be detailing in my next report. There were 4 of us on a weekend Astronomy/UFO watch in the Groom Lake area , parked at the White Mailbox, on ET Highway (375), 20 miles from the LilAleinn in Rachel. We set up “camp” at the famed “Black Mailbox”(now white). We erected our telescope for summer sky observation and kept eyes out for anything else that may have business in the area. At 11:20 PM, we swung the scope around to face North to observe a binary star. 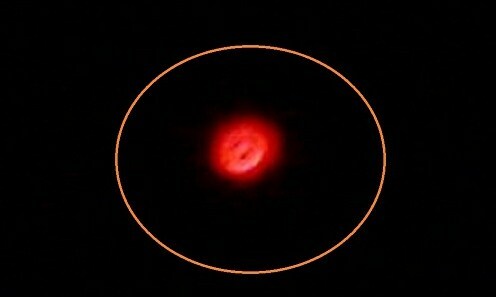 My friend then said, “what do we have here?” I looked in the direction,and immediately saw a pulsating red light which appeared to be spherical in shape. Since this is a strict “NO FLY” zone(for most aircraft anyway), it had my complete attention. It remained stationary for about a minute,changed color to a white pulsation, then dove at an approximate angle downward of 30 degrees.We lost sight of it for a moment, when my friend flashed it with a red laser pointer. Almost immediately it reappeared and changed to the red pulsation, perhaps in response to the laser greeting. When in the new position, it changed to a white pulsation, then back to red. About 45 seconds later, it zigged up to a higher position, sat there for about 15 seconds more , then took off at a 40 degree angle up and away! (Phenomenal acceleration!) I am a MUFON member, presently studying the Field Investigation Manual. My friend had a CE3 while in the Air Force in Europe at a “nuke” base. I have had a very close encounter before, which I will not discuss here. It was quite exciting, as this was my first sighting! Thanks for the MUFON forum. NOTE: The above image is a rendering. Thanks to MUFON CMS system. On the evening of Friday June 13th, 2008 my wife, sister and I witnessed a UFO while driving east on Highway 375 (otherwise known as the Extraterrestrial Highway). 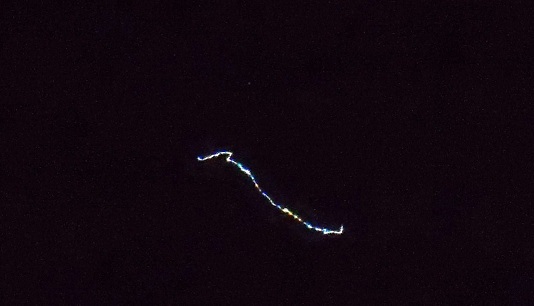 Approximately 9:30 PM, after passing Groom Lake Road, my sister saw an object in the sky, south of us. I pulled over the side of the highway and quickly exited the car. 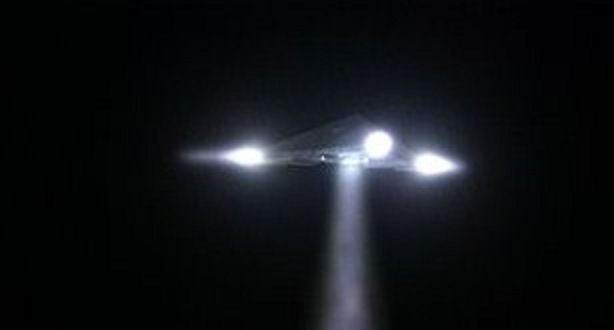 20-25 miles south of us, over some mountains, we saw an unknown craft fluttering around with the dexterity of a moth. This craft was at least the size of a two-story house (maybe larger, it is hard to judge size in the desert), and had two strobing lights, one green, one red. It was not a jet, airplane, or helicopter, as it fluttered around the sky like a butterfly. It would alternate directions immediately, dropping and rising 50 feet instantaneously. We observed the UFO for about 2 minutes before it sank below the mountains. Three possibilities immediately entered my mind regarding the UFO: 1. It was an alien spacecraft piloted by aliens. 2. It was an alien spacecraft piloted by military personnel. 3. It was an experimental aircraft reverse engineered utilizing alien technology piloted by military personnel. Five minutes later, the UFO appeared again. It hovered in the air, as if the pilots were skittish…somewhat afraid to be where they were. 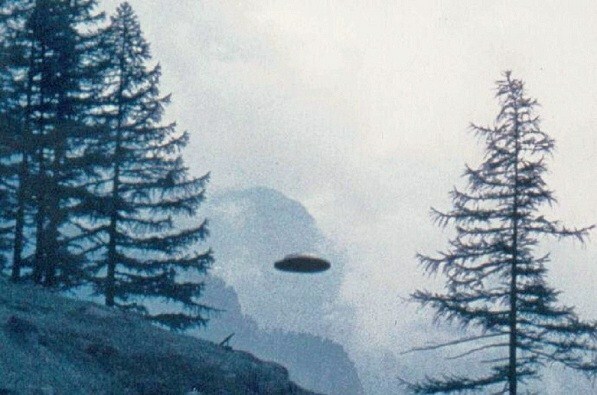 This sighting was even more exciting as we all were able to fully observe the UFO, its rapid movements making it impossible that this was a man-made craft. After another two minutes, the UFO sank below the mountains. Adrenaline pumping, we surveyed our surroundings, spotting stationary headlights behind us on the highway, about a mile or two away. This light did not move. After five minutes, we became nervous and decided to investigate. We drove back and saw a white SUV with government plates speed off. Relieved to not find Leatherface or any other deranged cannibal hillbillies in rusty pickup trucks, we decided to drive back to our observation point (approximately 26 miles southeast of the Lil Ale Inn). 5-10 minutes passed without any sign of the UFO. It was starting to get late, as I live 2 ½ hours away in Las Vegas, so I was ready to leave when the UFO hovered in the air once again. This time we all noticed an incredible sight: the mountain range to our left was being illuminated on the other side by a powerful light source intermittently, as if the Area 51 base was trying to communicate with the UFO with a sophisticated visual version of Morse code. The mountains were silhouetted in light. We were all silent, awestruck at the possibilities. 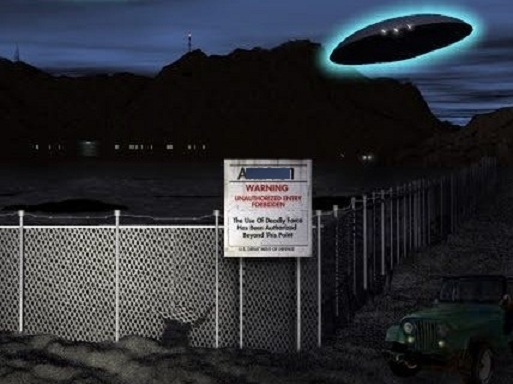 This new sighting made me realize what was happening: The Area 51 base was attempting to communicate with an alien spacecraft utilizing light signals. Why else would they utilize an enormous light source in such a manner? Every time the craft came into view, the light source would illuminate the mountains in an intermittent fashion. When the craft lowered, the light source would stop. It almost seemed as if the lights somehow reassured the UFO to not fly away. We could not tell if the UFO ever landed or not, as the mountain range blocked our view of the ground and Area 51. We stayed another 15 minutes, observing the UFO twice more. The lights from the base strobed even more powerful as the UFO fluttered around. It was obvious that we were observing something important, beyond our understanding. Was this the first time that this communication has taken place, or has this been going on years or decades and they are trying to refine their methods of communication? So many questions swirled around my mind, though the overwhelming feeling was one of awe and excitement. There is not a doubt in my mind that I witnessed an alien spacecraft. I plan on going back and camping out on a mountain overlooking the restricted zone boundary, and packing a video camera, telescope, and binoculars! Overall, we observed the UFO for over a half hour, 5 sightings in all, about 2 minutes at a time. I have completed 190 credits hours in college courses, my wife has a Master’s degree, and my sister attends George Washington University. We are all in agreement that we have witnessed a UFO. NOTE: The above image is a rendering.